TED Riveting talks by remarkable people, free to the world. TED’s official app presents talks from some of the world’s most fascinating people: education radicals, tech geniuses, medical mavericks, business gurus and music legends. Find more than 1,100 TEDTalk videos (with more added each week) on the official TED app — now for both iPad and iPhone. More info on the TED blog or download from itunes. Britannica The complete Encyclopaedia Britannica – the world’s most trusted reference source, enhanced for your apple iProducts. Search & Browse: Over 80,000 articles – expertly written and thoroughly fact-checked – on everything from A-Rod to Zebras. Our contributors include over 100 Nobel Laureates plus subject gurus like Bill Clinton, Tony Hawk, and Desmond Tutu. View: Photographs, diagrams, and charts help bring each topic to life. Make Connections: “LinkMap” lets you explore each article with a dynamic view of related topics. More info on Britannica apps or download from itunes. Google Earth Hold the world in the palm of your hand. With Google Earth for iPhone, iPad, and iPod touch, you can fly to far corners of the planet with just the swipe of a finger. Explore the same global satellite and aerial imagery available in the desktop version of Google Earth, including high-resolution imagery for over half of the world’s population and a third of the world’s land mass. More info onGoogleEarth or download from itunes. 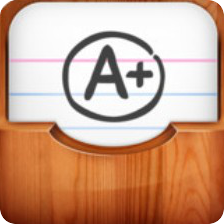 A+ Flashcards Free for limited time (regular price $4.99)! FreeAppReport.com Featured App! The most efficient way to create and memorize new words, idioms, terms or any other types of information! We researched the best study techniques out there to design a flash card platform that is easy to use, no matter what you’re learning, and no matter where you are in your learning curve. The platform supports text and images, and has multiple viewing options. More info on free version or download from itunes. “TED”, technology education development applications that are designed to provide steps on how to solve issues in students personal and academic life’s. Uses- Lesson planner for psychology courses.